Charcoal has become the de-facto standard for oily skin cleansing. Not only does charcoal absorb sebum (oil) but it absorbs things such as impurities in the skin, dead skin cells and bacteria too. It is one of those great ingredients that is wonderful to use because it does so much for the skin. It can be used on any skin type too. Not only can those with oily and acneic skins use it but those with dry, mature and normal skins can take advantage of charcoal's pore decongesting qualities. Let's discuss Garnier SkinActive Ultra Clean 3-in-1 Face Wash, Scrub and Mask with Charcoal. This 3-n-1 cleanser, scrub and mask is an innovative face wash that can be used in 3 different ways to help to purify the skin. As a daily cleanser it cleans out pores and deeply clears skin of dirt, oil and impurities. As a face scrub it improves the skin's texture so that it is softer and smoother. As a face mask it reduces sebum. Formulated with charcoal and white clay, this product was designed to address the needs of oily and combination skin. After use, skin feels fresher and clean. FACE WASH: Mix a quarter-sized amount with water in your palm until it start to lather. Apply to face. Rinse off. FACE SCRUB: Wet hands and face then squeeze into hands and rub together. Apply to face and massage gently. Rinse off. FACE MASK: Up to 3 times per week apply on face and leave on for 5 minutes or until fully dry. Rinse off. I have dry skin in the winter and combination skin in the summer. This product is great to have in the summer to help with my persistent acne that pops up in the summer. In the winter I still have some acne so I keep a product like this around to use on my chin only, as use for a decongestant on my pores. It really helps clean them out and make them able to be feeling 'clean' again. This is the kind of cleanser, scrub & mask that can be drying if used too much though. I would only recommend that those with oily/acneic skins use it up to 3 times per week as a mask and daily as a cleanser. And up to 3 times per week as a scrub. If you have active pustules do not use this as a scrub. If you have dry, mature or normal skin, this should only be used once a week as a mask. It should not be used as a cleanser or scrub, it would be too drying for the skin. Combination skin could use this as a cleanser every other day in the summer. And once a week as a scrub/mask. 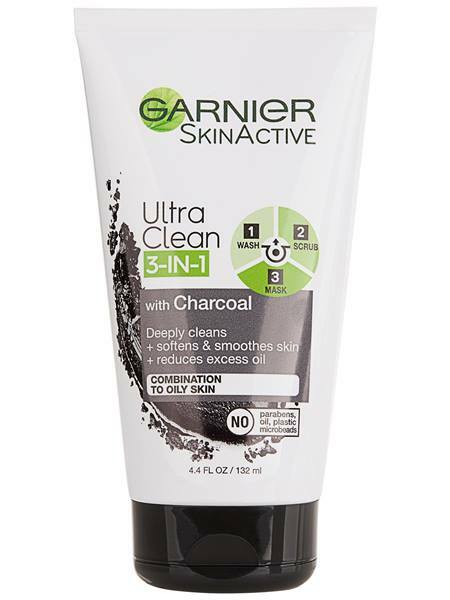 Garnier SkinActive Ultra Clean 3-in-1 Face Wash, Scrub and Mask with Charcoal retails for $7.99 and can be purchased online at www.garnierusa.com, www.drugstore.com,www.amazon.com and www.walmart.com. This product can also be purchased at Walgreens, Rite-Aid, CVS and Wal-Mart stores. Like Garnier on Facebook: https://www.facebook.com/garnierusa; Follow Garnier on Twitter: @garnierUSA; Follow Garnier on Pinterest: https://www.pinterest.com/garnierusa/; Follow Garnier on Instagram: https://www.instagram.com/garnierusa/; Subscribe to Garnier on YouTube: https://www.youtube.com/user/GarnierUSA and Follow Garnier on Google+:https://plus.google.com/s/garnierus/top.